I’ve lately been brought to the attention of several Cze Char stalls that have opeh leaf hor fun in their menus. After eating at these stalls, I have to say that the flavours seem to be very different in most of the stalls though they all are quite authentic in their own ways. 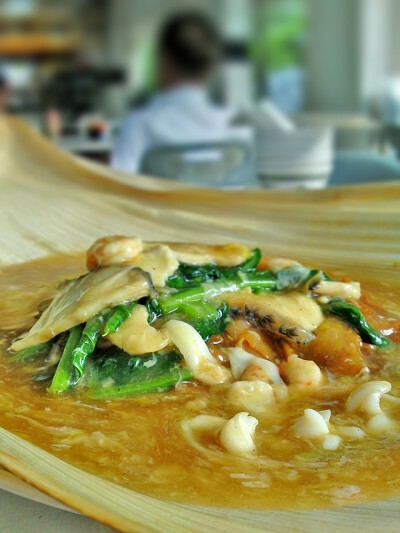 Basically, the one that I grew up eating(Fei Lao), is my gold standard opeh leaf hor fun. It’s the combination of the ingredients used, the bud-titillating gravy and the superb charred hor fun that makes it really special for me and it is arguably the best $10 hor fun in town. Some stalls can have excellent gravy, while others can have a good wok hei or very very good ingredients thrown in but none excelled in all of those three areas. That is why, after eating at a few stalls, Fei Lao Seafood still sits at the top, and that is simply because they are a master of making those 3 things right. There are so many restaurants in Singapore that have the keyword ‘Hong Kong Street’ but which is the real one? And I mean the really really real one who started a Cze Char stall before everyone else? If you are looking for the really really genuine answer, unfortunately I don’t have it but the Hong Kong Street Chun Kee at Bukit Merah is believed by many to be the original stall and they even proudly printed the timeline of their locations history on their namecard. 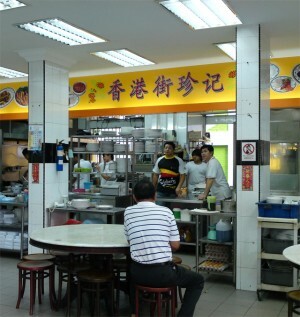 Well if no other stalls started their business before 1983, then Hong Kong Street Chun Kee should be the first to operate from an outlet in Amoy Hawker Centre in 1983. For those who don’t know(or haven’t heard of), here is where the famous San Lou Hor Fun was invented sometime back when a customer requested just for beansprouts, hor fun and sliced fish to be seared lightly in the wok. 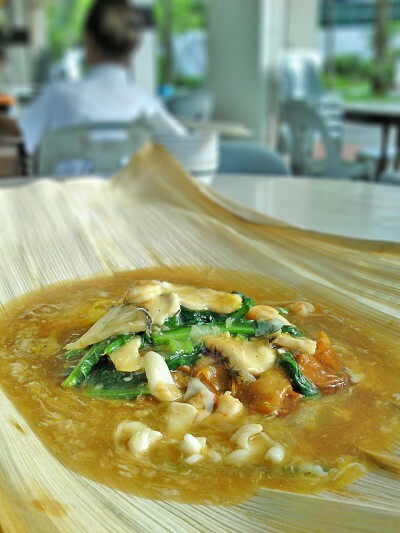 For just $6, you can have an opeh leaf hor fun here but this is a seafood version. You can also get a ‘San Lou’ version for $10 which will have generous amount of sliced fish. For $6, I thought the portion was quite generous but that was about it. Seriously. It was quite disappointing to see the kind of ingredients used were nothing more than what you can find in a $3 pack which you can buy from any kopitiam. Ok maybe it’s a good thing that there were several pieces of sliced fish which was quite delicious but the prawns and sotongs were really something that didn’t quite justify it being called an opeh leaf version. So that effectively put the responsibility of the ‘excitement’ in the gravy and the wok hei in the hor fun. SADLY, both the gravy and the hor fun were equally disastrous. I think it’s not too difficult to make this gravy from home. You just need some soy sauce, some pepper, starch and eggs, well it really does taste like nothing more than that. The hor fun didn’t tasted charred but doused with dark soya sauce. As traditional as how a $3 hor fun can get, this cost $6 just because it’s been put on an opeh leaf. Ok to be fair, the quantity is bigger than your usual $3 pack. For $6, if this were to be sold as a normal hor fun, it doesn’t have enough oomph to impress. As a $6 opeh leaf version however, you eat this at your own peril because the taste, whether you judge it from the gravy, the ingredients or the hor fun, is absolutely characterless. It looks quite good on the opeh leaf no doubt but characterless nonetheless. As an opeh leaf version, this is not remediable, but as a kopitiam $3 version, you can eat this at any Cze Char stall – literally. Conclusion: Disappointing. You can eat this from any cze char stall from $3. Even the necessary chinese wine flavour that is essential in a good hor fun is sorely missing. By default, this is a $3 version. Put it on an opeh leaf, it still taste like a $3 version. So run away from this because it ain’t going to worth your time. Likes: Plenty of sliced fish. Cheap for the generous amount(not forgetting the cost of the opeh leaf). Dislikes: Ingredients no power. Gravy no power. No wok hei but soya sauce used instead. You ate wrong. They are famous for san lou hor fan. And also try out the fish head noodle next time, almost every table will order it. But I am looking for opeh leaf hor fun.